You will be able to start earning money from your XD Skills. Build a UX project from beginning to end. Build & test a full mobile app. Build & test a full website design. You will have a project of your own to add to your portfolio. 42 lectures of well-structured, step by step content. Learn to design websites & mobile phone apps. Work with fonts & colors. Prototype your designs with interactions. You’ll create realistic prototype complete with micro interactions. Send your designs for feedback & commenting. Create your first UX brief & persona. How to use premade UI kits. Learn professional workflow tricks & shortcuts. Build a mobile app prototype that responses to voice commands. You will be able to talk correctly with other UX design professionals. You’ll learn how to choose colors. You’ll learn how to pick the correct fonts. You’ll be able to send your finished work to other professionals in the correct formats. You will need a copy of Adobe XD 2019 or above. A free trial can be downloaded from Adobe. No previous design experience is needed. No previous Adobe XD skills are needed. Are you excited to get into the world of UI/UX but you don’t know where to start? This course will allow you to add UX designer to your CV & start getting paid for your new skills. Kate: Excellent course – Dan is an excellent teacher and I thoroughly enjoyed following along with his videos. Highly recommend! July 2018: I have updated this review with an extra star because of how useful this course has been in the months following it’s completion. I am using Adobe XD daily and Dan’s instruction was instrumental to adding this feather to my front-end web development hat. First I’ll show you how to construct a good brief & UX persona. Then you will learn to create simple wireframes, from there we will learn how to implement colours & images correctly in your designs. You will learn learn the do’s and don’ts of choosing fonts for web & mobile apps. We will also cheat a little by exploring pre-made UI kits to speed up our workflow. We will build & prototype both a website design and a mobile app design, connecting pages and also adding full interactivity ready for user testing. 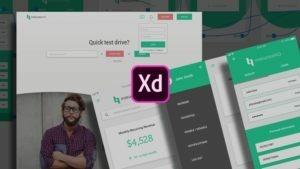 I will share with you all the secret tricks inside Adobe XD that help you speed up repetitive tasks and we will work all the way through to exporting correct files & creating your design specs. There is a project for you to complete during this class which will help develop your skills and will give you something for your own portfolio. It is now time to upgrade yourself & learn Adobe XD. Anyone who wants to start using Adobe XD in their career & get paid for their user experience design skills. This course is for beginners, newbies & amateurs in the field of UX design. Aimed at people new to the world of design & user experience. For anyone that needs to add ‘UX Design’ to their portfolio. In that website only his students started to follow his video that’s why most of the videos in skillshare has low view. Please guy please upload his all video course I beg you. Hey Daniel, thanks for the tutorial. Do you also have tuts for other Adobe tools? Just went through the course. Looks brilliant. I think you might actually be able to submit on hackr for the designing community.